For over 80 years, Stevens Publishing has been providing information solutions and quality services within the publishing industry. Today, Stevens Publishing, with its corporate headquarters located in Dallas, TX, has grown into a multi-million dollar publishing company. Stevens Publishing’s magazines – Environmental Protection, Occupational Health & Safety, EH&S Products, Security Products, Home Health Products, Water & Wastewater Products and Mobility Management – are leaders in circulation and editorial within the health and safety, industrial hygiene, ergonomic, environmental, water and wastewater, healthcare, security and home automation industries. Stevens Publishing has created a multi-media network designed to meet a variety of marketing needs. Stevens Publishing also offers seven newsletters designed to keep you abreast of the latest health, safety and environmental news coming out of Washington, D.C. Stevens’ news bureau tracks legislation and provides timely, comprehensive and objective reporting in Environmental Protection News, OSHA Week, Employee Assistance, Waste Week, Occupational Health & Safety News, Workplace Ergonomics News and Continuing Care News. Stevens Publishing’s online resources are an exciting addition to its network of information services, offering the latest features and articles direct from the pages of the magazines and newsletters. Also available on its web sites are industry news and trends, online buyer’s guides, employment information, events calendars, online surveys, list services and more. 1105 Media was formed in a partnership between industry veteran and former Reed Elsevier and Petersen Publishing executive Neal Vitale and two private equity sponsors, Nautic Partners, LLC and Alta Communications. 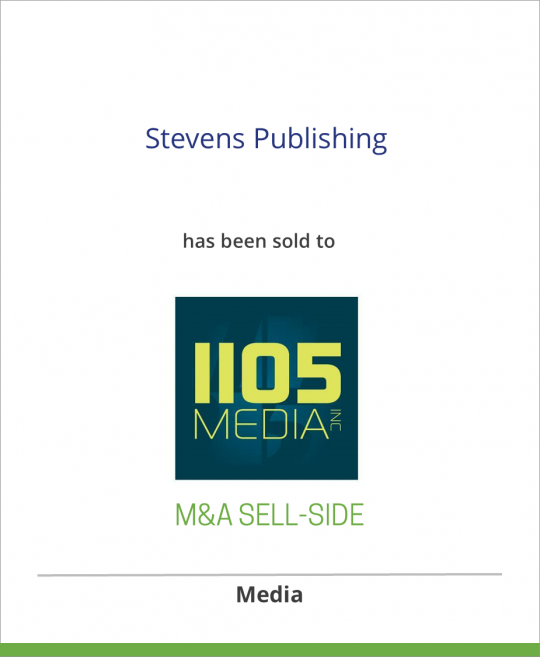 The newly-formed 1105 Media will be a combination two b2b media acquisitions: Stevens Publishing and 101 Communications. 101 Communications, based in Chatsworth, California, has 9 publications, 44 conferences and events and extensive digital offerings aimed at the information technology community. Nautic Partners, located in Providence, Rhode Island, and founded in 1986, has made over 95 private equity investments and currently has over 30 active portfolio companies and $1.8 billion under management. Alta Communications, based in Boston, is a leading private equity firm specializing in media and communications. Alta manages over $1.5 billion and has invested in over 100 portfolio companies. For more information, visit www.nauticpartners.com and www.altacomm.com.